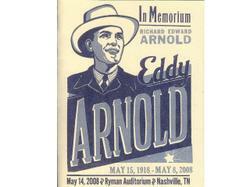 the 90th birthday of Eddy Arnold. But I'm actually writing this at my computer on the evening of May 14th, just hours after being seated on the front row at the Ryman auditorium, roughly 10 feet from Eddy's casket. Today as I sat there listening to the music, and the eloquent words spoken about Eddy, my thoughts flashed back to the early 1950s when... as an ogle-eyed 9 year old kid... I sat on the front row, just about 10 feet from the stage, watching Eddy perform. In my wildest imagining, it would never even cross my mind that -- more than a half-century down the road -- I'd be one of the pallbearers carrying this personal hero to his final resting place. It was the saddest of honors. As we stood around backstage, the conversations ranged from funny recollections of Eddy's kind, quirky personality -- to the astonishing details of his career. But one little anecdote sticks in my mind. My pal Mike Curb told me he was there at Eddy's bedside just days before he lapsed into a coma... Eddy told him, "You know Mike, I think I have one more album in me... I just gotta get better." After a remarkable career spanning seven decades, Eddy -- with his quiet, understated confidence -- felt he could still offer the world one more album of wonderful music. I hope he left this world knowing he gave us plenty.